In order to avoid boring anyone to death and give me time to do other things with my frankly pointless existence I’ve often fairly conservative with my word count when reviewing. It pleases me then that the vibe this particular pub can be summarised in two words which were scribbled on a bottle behind the bar. These words are Bacon Vodka. The Kings Stores was until recently somewhere I was aware of the existence of but had less interest in going in than sticking my buttocks into a ham slicing machine. It had an aura of despair. However on one of my wanderings in search of beer and or pie and having been denied entry to a dog hating pub up the road my companion and I stumbled across this pub in its current incarnation and we were far from disappointed with what we found. But what in the name of Nicolas Lyndhurst’s sock drawer does this have to do with Bacon Vodka? I hear you cry. Well bacon is one of the most reassuring and humble of foods. Is there much in life better than a simple bacon sarnie to a hungry man? The smell of a sizzling rasher in the morning to the hungover? The promise of a plate of high fat treats accompanied by the stripy pink pig snack? Unless your deity prohibits you from this divinely salty treat of you’re a vegetablist I’d wager that right now you’re probably nodding and salivating. This simple perfection is something that has been achieved at the Kings Stores – it is therefore pub equivalent of bacon. Understated, comfortable, familiar and in the right cirumstances downright classy. Though meat flavoured potato derived alcohol is on offer this is by no means the only drink avaliable. It’d be odd if it was. There are a decent cluster of ales on tap accompanied by a smattering of ciders and lagers which do stray beyond the norm. The spirits shelf is well stocked too no doubt with some hidden gems concocted on site waiting to be sampled by more those with a more gregarious pallet. Food here also get a big thumbs up. My search for a pie was rewarded with one as big as my face (and I have a big face) and the rest of the menu shows equal promise. Everything was served up by genial staff who even offered to bring my second pint over to the table so as not to interrupt me shovelling pie into my trap. 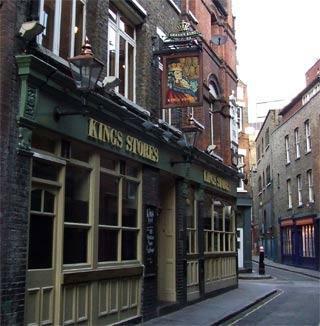 All round this pub is brilliant; so take a wander around Bishopsgate and the warren of streets between Old Spitalfields market and Liverpool Street, walk in the footsteps of Jack the Ripper, see where they filmed some of those Harry Potter talkies and then drop into the Kings Stores. I’ll bet you a shot of Bacon Vodka I know which part of that day out you’ll enjoy the most.